“Rebuilding the Present” displays the work of seven artists who engage in meditative practices. The exhibition is open to the public at the Weinberg/Newton Gallery through April 13. Artist and curator Holly Cahill first stumbled upon the concept of meditation when her high school teacher introduced her to Eastern religions. But it wasn’t until she started a particularly stressful job years later that she found the need to apply the concepts she learned in class to her everyday life. 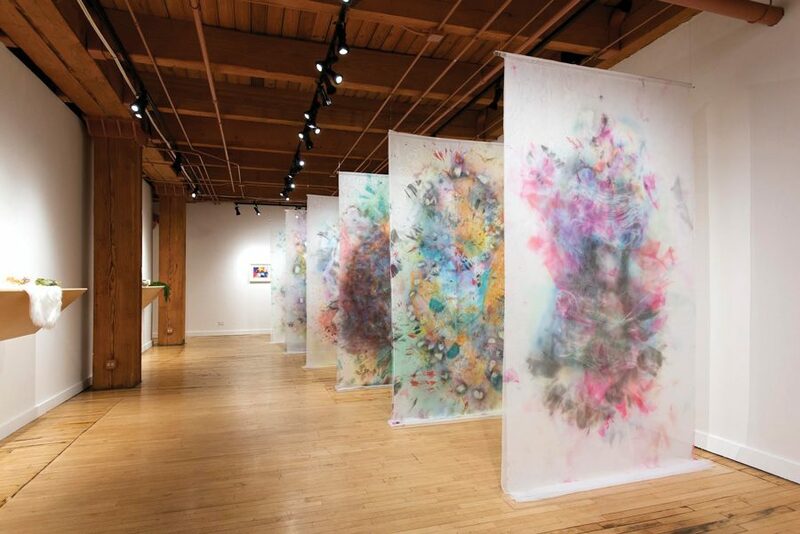 Inspired by the transformation she noticed in herself, Cahill proposed an exhibition examining the connection between meditation and art to the Weinberg/Newton Gallery. “Rebuilding the Present” is centered around the concept of meditation as an instrument to foster self-care and as a tool to cope with everyday life. In partnership with the David Lynch Foundation, the exhibition features a wide range of art forms, including documentation, paintings and audio works that incorporate different meditative practices. The exhibition opened last weekend and runs through April 13 at the Weinberg/Newton Gallery in Chicago. Cahill said the show is designed to navigate viewers through multiple layers of experience that involve connections to themselves, each other and the world. She said each of the seven artists in the show has their own way of addressing the concept of connection, yet they all strive to create space for wellness. Featured artist Leslie Baum, who teaches drawing to adults at the Art Institute of Chicago, said she was able to see the impact of arts on the mental health of her students who have highly-demanding professions. She said the act of creating art has a similar effect to that of meditation by bringing the creator into the present. Baum said the show is “on point” and deeply resonates with her values. She added that she hopes viewers can take time to see the diversity in the works of art and the different approaches the artists take to engage people in multiple levels. As for her own installation in the exhibition, Baum said she wants to create a space where viewers feel welcomed and comfortable. She creates this effect with a collection of “meditation pillows” that are meant to invite the viewer into the art. “When you’re at home, you linger. When you linger, you relax. When you relax, you’re able to notice more things, so you might have a deeper experience with the art, which is something I’m striving for,” Baum said. Featured artist Cameron Harvey, who teaches yoga and practices meditation, said any act of paying attention, such as gardening or simply looking at art, can have meditative effects. She said the exhibition allows viewers to reflect on how they interact in both personal and public spaces. The artist added that she hopes people can question the concepts of “quiet time” and boredom as they move through the exhibition. Harvey said what further draws her to “Rebuilding the Present” is the show’s ability to provide an escape from the everyday buzz of technological devices. She said there is a “collective cultural understanding” of the harm cell phones are doing to our emotional and spiritual well-being.